True church growth is a result of a positive church experience, members inviting family and friends as well as a reputation that is spread by word-of-mouth. Many people will visit a church several times before making a decision to call that church home. The challenging part, particularly for churches of a few hundred people, is that visitors can sneak in and out without anyone even knowing they were there. Someone once said that a visitor will make a decision about a church long before the pastor even begins to speak. If this is true, what is the visitor evaluating in the process? Finding your way around any new environment can be challenging, particularly if there is not appropriate directional signage. Drive through your campus and look for those pivotal decision points and determine if a directional sign could help a visitor find where to park, drop children off or enter the building. This is particularly important if the campus has multiple buildings or entrances. 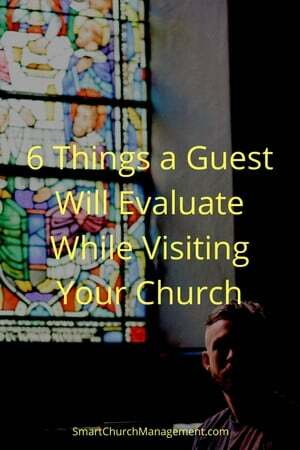 The easier you can make it for a visitor to find what they are looking for, without asking questions, the better their first impression will be of your church. As a visitor enters the building, who is the first person they interact with? Is it a friendly parking volunteer, greeter or usher? Are these pivotal people trained to be friendly yet not overbearing? How welcoming are members to someone they don’t know who is sitting next to them? Are there people assigned to look for new people and say hello? This can be tricky because some people like to be recognized as being new and others want to blend with the crowd while they assess the environment. How inviting is the facility? Is it clean and clutter free or do the windows have fingerprints on them? Is there debris laying in the flowerbeds or is the landscape meticulously manicured? All of these subtle things leave an impression on a visitor and tells a story about the culture and priorities of the organization. What is this church trying to accomplish – what is the mission? What kinds of programs are there for my kids? What kinds of volunteer opportunities are there for me? What kinds of discipleship options are there for my spiritual growth? What are the steps to becoming a new member? It is important to make this kind of information easy to access and understand. Think about how information is shared and the different avenues for providing that information. Does all information get communicated through announcements, video or the church website? Is the information consistent in every forum? How often is information updated and how much notice do members receive when marketing an upcoming event? Manage church communications by taking the time to think about who needs to know what kinds of information and when do they need to know it. Visitors who decide to become members need to understand what will be expected of them once they make that commitment. Think through the new member process and be sensitive to putting too much pressure to participate, particularly at the level of long time members. The last thing you want is to scare someone away because they couldn’t fulfill the requirements of being a new member. Most churches want to grow and include more people to help fulfill their mission. Taking the time to think through a visitor experience can be one way to help transition a visitor into a new member! Great breakdown Patricia! You always have great content, thanks! Depending on the level of ‘church experience’ a visitor will also be evaluating their ability to connect with the worship and teaching. People make decisions everyday if your church is a good organization as they drive by. These decisions are subconsciously made, so we need to always keep our churches very presentable to the public. Good examples of very presentable church are the Mormons and Seventh Day Adventists facilities. There certainly others, but in my travels across the country these two churches are always in top shape, clean and neat beyond everything around them.